THE expansion of new Zambeef outlets has enabled the company to better serve its customers across Zambia, says head of marketing and corporate affairs Felix Lupindula. Mr Lupindula said Zambeef was working towards rolling out more outlets and macro-outlets throughout the year in selected areas to fulfill its objective of providing quality, affordable and readily available products to its customers. He said the outlets were designed to reflect international standards assuring customers of a convenient, conducive and safe shopping environment. “The Mungwi Road outlet follows the blueprint of Zambeef’s macro-outlets which give customers the convenience of accessing its full range of products under one roof, and it brings its services closer to its customers in and around surrounding areas,” he said. He said the group was also in the process of rolling out its West Africa expansion in Nigeria and Ghana. 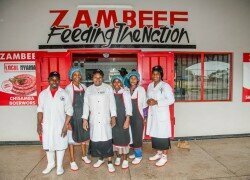 Zambeef Products Plc is one of the largest integrated food companies in Zambia and the region. The group was principally involved in the production, processing, distribution and retailing of beef, chicken, pork, milk, dairy products, eggs, stockfeed and flour. The group also has large row cropping operations (principally maize, soya beans and wheat), with approximately 8,120 hectares of row crops under irrigation which is planted twice a year and a further 8,480 hectares of rain-fed/dry-land crops planted each year producing 120,000 tonnes of grain annually. The company slaughters around 58,000 beef cattle, 7.9 million chickens and 53,000 pigs per annum, while also processing 12.3 million litres of milk, producing 130,000 tonnes of stock feed, 40 million eggs, 89,000 shoes and processes 99,000 hides in its tannery per year.